Interesting if retroactively obvious way to future-proof URL shortener links. Chris Eng shows how crypto is done. Finishing in the top 3 isn’t too bad and whoever dreamed up the cipher in the cover clearly had a lot of fun with it. Red line dome on Flickr – Photo Sharing! The MIT hackers strike again. Too bad they couldn’t get a full-size Red Line car up there though. Trenchant as always: “So Bobby Jindal makes fun of “volcano monitoring”, and soon afterwards Mt. Redoubt erupts. Susan Collins makes sure that funds for pandemic protection are stripped from the stimulus bill, and the swine quickly attack. “For the old country, the benefits would be obvious. A more intimately sized Congress would briskly enact sensible gun control, universal health insurance, and ample support for the arts, the humanities, and the sciences. Although Texas itself has been a net contributor to the Treasury—it gets back ninety-four cents for each dollar it sends to Washington—nearly all the other potential F.S. states, especially the ones whose politicians complain most loudly about the federal jackboot, are on the dole. (South Carolina, for example, receives $1.35 on the dollar, as compared with Illinois’s seventy-five cents. )” A couple other trenchant points in this meditation on the idiocy of secession. Billboard Top Classical Charts, 2009-05-02. See #3 and #8. Last Friday’s Billboard classical chart featured the debut of the two BSO CDs on which I performed, the Brahms Requiem and Ravel Daphnis et Chloé. (A third BSO recording in which I participated, Bolcom’s Symphony No. 8, is only available as a download.) 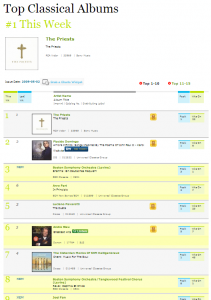 The Ravel was at number 8 on the top 10, and the Brahms was at number 3, behind The Priests and Amore Infinito: Songs inspired by the Poetry of John Paul II (Karol Wojtyla) by Placido Domingo. The recordings are available digitally or physically from the BSO. I am still trying to see where the discs are distributed–they don’t appear to be on Amazon right now, but they are on CD Baby (Brahms, Ravel) and ArkivMusic (Brahms, Ravel) at the moment. That they are getting this kind of sales traction without Amazon’s presence is kind of impressive to me. The charts are timely, because the Tanglewood Festival Chorus will be on stage again this week with the BSO, performing the Berlioz “Te Deum” along with the PALS children’s chorus. The work is massive, with two choirs (140 voices in our performance) plus the children, and full orchestra and organ. The BSO’s podcast last week gave a good introduction to the work. For my preparation, I have been sweating the words. One doesn’t get to sing a Te Deum too often, and I haven’t done one with the TFC and didn’t memorize the traditional text when I last performed one (Arvo Pärt’s Te Deum with the Cascadian Chorale in Bellevue, Washington five years ago). But we have a few more rehearsals this week so I have time to get the text into my head, I think. Should be fun.